Offering additional protection during a range of tasks, our Oversleeves Disposable Blue are an economical option for all environments. Made from a lightweight and waterproof polythene, they slip easily over arms of all sizes with elasticated end on either side to hold them in place. 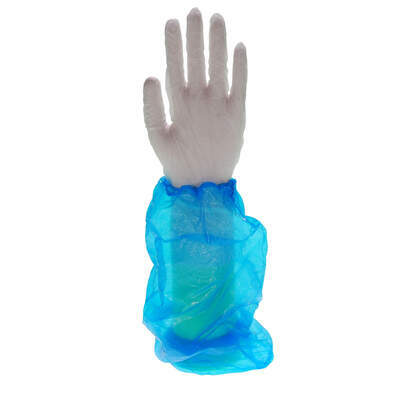 Effectively protecting wrists and forearms from unwanted fluid transfers during catering and medical procedures, the bright blue colour is highly visible to prevent contamination. Provided in a large and economic pack size, these oversleeves can be disposed of immediately after use and stored until required in their compact box. To maintain your current hygiene regime, we also have Gompels Foaming Antibacterial Cleansing Spray and our Gauntlet Polythene Blue available at exceptional wholesale prices.